I won Dangerous Ambition through the Goodreads First Read program, and overall I’m glad I did. This was a fascinating and extensively researched biography of two very intriguing women. 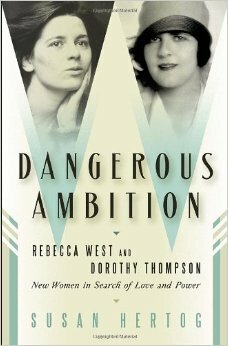 I didn’t know much about either Rebecca West or Dorothy Thompson, but I do believe that this book gave me a comprehensive overview of their good and bad qualities. It’s true that neither woman came off as a completely likeable person, but I didn’t find this to detract from the appeal of the book. In fact, I enjoyed it all the more because the author clearly held nothing back. Both women lead dynamic lives, especially considering the time periods in which they lived. Dorothy was an accomplished journalist. In fact, she was the first reporter to be granted an interview with Adolf Hitler, and was likewise the first reporter expelled from Germany, after she questioned his manhood, breeding and mental stability. Rebecca was extremely prolific, and wrote dozens upon dozens of critiques. She was of the opinion that her female contemporaries were writing the best work, and that the ‘establishment’ deemed their work as ‘minor fiction’. Of course much of this book centers around the love lives of these women, which I wasn’t particularly looking forward to – until I discovered that Dorothy was married to Sinclair Lewis, and that Rebecca had a long-term affair and child with H.G. Wells. The look into the lives of these accomplished authors was quite interesting in its own right, especially as the book followed their successes and falls from grace. I expected there to be more overlap between Rebecca and Dorothy’s lives, and I expected that they would be very good friends. As it turned out, while there did seem to be an awful lot of coincidences in their lives, they weren’t really close friends. I thought the dual biography setup was interesting, unique and ultimately successful, though it didn’t turn out the way I expected it to. Of course, the book wasn’t perfect, and my main issue was the way it jumped around in time. One chapter would cover one woman’s life in 1930, and the next would jump to the other woman’s life in 1915. There didn’t seem to be a method behind the jumping, and it got especially jarring when while reading a chapter about one women, there would be a mention of something that happened to the other – only we hadn’t gotten to that chapter yet. Overall, this book was jam-packed with information, and was extremely detail rich and really immersed me in the world of these women. At the same time, it was quite accessible and I would highly recommend it to anyone who’s interested in feminist literature, literary history, or simply a thought provoking biography. This entry was posted in book reviews, non-fiction and tagged book review, hertog, non-fiction. Bookmark the permalink.